Your day-by-day itinerary now includes Waikiki Beach as well as Makapuu Lighthouse Trail. When in Honolulu, make a side trip to see Polynesian Cultural Center in Laie, approximately 1h 05 min away. Next up on the itinerary: take in the pleasant sights at Diamond Head State Monument. To see more things to do, where to stay, traveler tips, and more tourist information, use the Honolulu travel itinerary planner. The Route module can give you travel options from your home to Honolulu. In March, daily temperatures in Honolulu can reach 81°F, while at night they dip to 68°F. Wrap up your sightseeing on the 20th (Wed) early enough to drive to Haleiwa. Haleiwa is a North Shore community and census-designated place (CDP) in the Waialua District of the island of Oahu, City and County of Honolulu. Your list of things to see and do now includes Lanikai Beach, Sharks Cove, Waimea Bay, and other attractions. 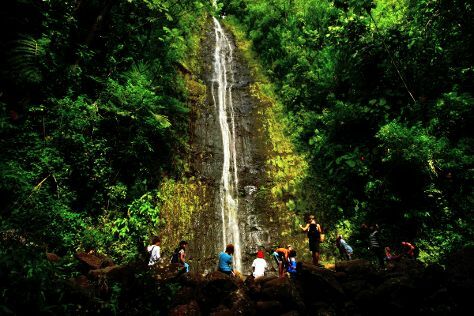 Step out of Haleiwa to go to Honolulu and see Manoa Falls, which is approximately 58 minutes away. There's more to do: browse the different shops at Haleiwa Town Center. To find other places to visit, where to stay, and more tourist information, you can read our Haleiwa online holiday planner . Traveling by car from Honolulu to Haleiwa takes an hour. Alternatively, you can take a bus. In March, Haleiwa is a bit cooler than Honolulu - with highs of 76°F and lows of 62°F. On the 25th (Mon), you're off tohome.